Sea Lions remember prey hot spots to maximize hunting efficiency. When you forage for food, you need hunt no further than your corner restaurant. When a sea lion forages for food, it could exhaust its time and energy and leave its young to starve while searching the ocean with little chance of success—if it didn’t know where to look. NOAA Fisheries scientist Mike Sigler at NOAA’s Alaska Fisheries Science Center wants to understand how sea lions find prey efficiently. 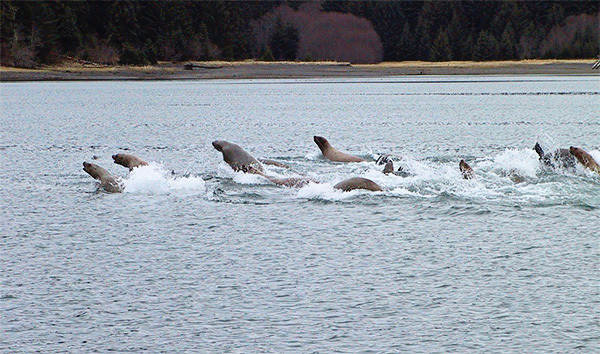 This hunger for knowledge led to a series of studies on Steller sea lion foraging behavior in Alaska. 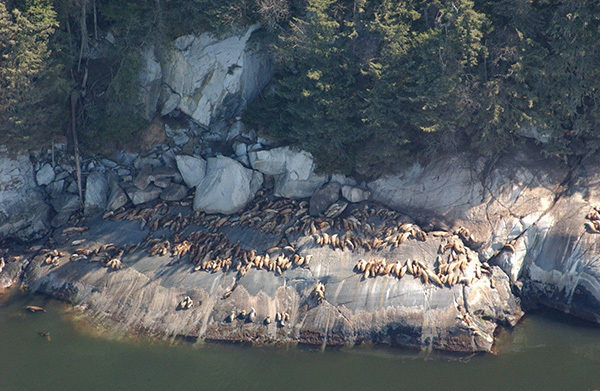 In the final study, published this week, Sigler and coauthors Scott Gende (National Park Service) and David Csepp (Alaska Fisheries Science Center) document for the first time the day-to-day persistence of prey “hot spots” and how sea lions respond to them. Western Steller sea lion populations in Alaska plummeted by 82% between 1975 and 2003—and the decline has been linked to food availability. Since then they have increased by approximately 2% per year overall, but have continued to decline in western half of the Aleutians, according to marine mammal scientists Lowell Fritz and Tom Gelatt of NOAA’s Alaska Fisheries Science Center. Because the Steller sea lion is a federally protected species that preys on commercially important fish like walleye pollock, NOAA Fisheries and the fishing industry want to understand sea lion foraging habits. The more accurate information managers have, the smaller the margin of error and the less conservative protective measures need to be–-and therefore less likely to affect fisheries operations. In an earlier study, Sigler and colleagues examined sea lion foraging behavior in response to seasonal changes in prey. “We found that sea lions follow a trapline of prey concentrations that change with the seasons: herring to walleye pollock to salmon and so on. They repeat the circuit year after year, guided by memory to return to the same areas. Their numbers also respond to the amount of available prey (’numerical response’)”. These findings provided evidence that sea lions can target certain foraging areas from one month to the next. But sea lions typically embark on foraging trips on a daily or weekly basis—and they have to relocate their prey every time. “We designed the final study to quantify characteristics of prey hot spots on a day-to-day basis, to find out how persistent they are on daily or weekly scales, and see how they influence sea lion foraging,” Sigler says. Favorite Channel in Southeast Alaska offered an ideal study location. It is sheltered enough that the scientists were able to sample throughout the winter using small, cost-effective vessels. It offers a variety of foraging habitats for sea lions, as well as an island haulout for resting and rearing young. Large schools of herring overwinter here, attracting predators like humpback whales and as many as 600 Steller Sea lions. They discovered two aspects of prey distribution that were relevant to sea lion foraging decisions. First, high numbers of prey were concentrated in a small fraction of the study area, creating a patchwork of hot spots. Second, these prey hot spots were persistent from day to day. Both of these attributes are explained by the biology and behavior of the Pacific herring that made up almost all of the prey available to Steller sea lions during the study. 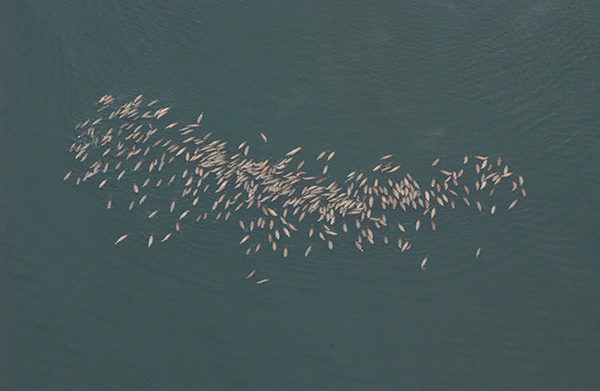 In November, dense schools of herring move into the channel. 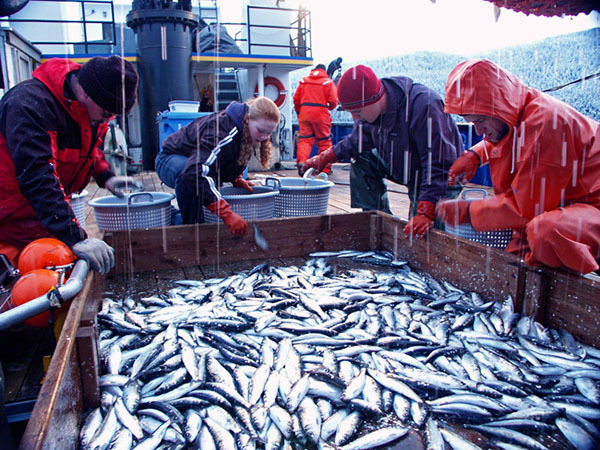 During winter the herring do not feed, as there is little prey available to them. They conserve energy by moving very little—creating foraging hot spots that persist over the short time scales. More importantly, the study demonstrated that persistence of these prey hot spots was an important characteristic in determining whether sea lions used them. This ability is especially crucial for Steller sea lions. Unlike relatives such as Northern elephant seals that remain at sea foraging for months, Steller sea lions return to their haulouts between daily or weekly foraging bouts. Daily persistence of hot spots has tremendous value for sea lions because they must make repeated decisions throughout the winter on where to concentrate search efforts. Persistent prey patches make this job much easier.